SANDPOINT, Idaho— The city of Sandpoint passed a resolution last night supporting recovery of the endangered mountain caribou and calling for augmentation of the southern Selkirk herd, which is the last herd found in the contiguous United States. 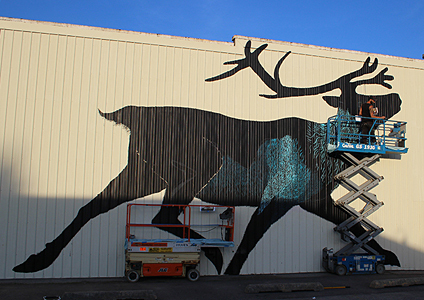 The resolution comes just as the Center for Biological Diversity and Selkirk Conservation Alliance are preparing to unveil a mural of the caribou on the Snow River Building in downtown Sandpoint. Photo by Roger Peet. Mural artists are Roger Peet, Mazatl and Joy Mallari from the Justseeds Artists Cooperative. This photo is available for media use. The unveiling ceremony, at 2 p.m. Sunday, will include remarks from Noah Greenwald, the Center's endangered species director, and Roger Peet, the Justseeds Collective artist who designed and oversaw the painting of the mural. Caribou once ranged across much of the northern lower 48 states, including the northern Rocky Mountains, upper Midwest and Northeast, but today are down to only the southern Selkirk herd, which straddle the border with Canada. The herd is part of a unique form of woodland caribou, known as mountain caribou, that are adapted to surviving winters with deep snow, relying on dinner-plate-sized hooves that work like snowshoes and an ability to subsist for three to four months at a time on nothing but arboreal lichens found on old-growth trees. The herd was protected under the Endangered Species Act in 1984 and in recent years has declined to precariously low numbers, with fewer than 50 animals now remaining. In the 1990s the U.S. Fish and Wildlife Service augmented the southern Selkirk herd with animals from other herds, which helped to stabilize the population for a time. But the Fish and Wildlife Service has repeatedly determined that further augmentation is badly needed to boost herd numbers and ensure caribou do not die out in the lower 48 states. Sandpoint's resolution supports augmentation and shows that there is local support for saving the southern Selkirk herd.